I’ve found that if you’re going to write a lot it’s important to have a pen that writes well and is comfortable to hold. I thought I would list my thoughts about the pens that I use for my letters in case you want to find a good pen for letter-writing. Uni-Ball Jetstream 0.7mm This is solid inexpensive pen. It’s a retractable ball-point and writes smoothly and has something they call “Super Ink” – which is supposed to help prevent check fraud by trapping the ink in paper helping to stop criminals from check washing. I’m not so concerned with the fraud aspect of it, but the Super Ink does have a nice continuous flow and dries quickly. 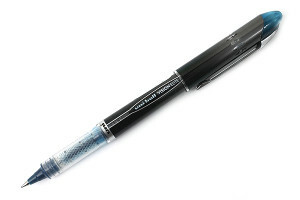 The barrel of the pen is comfortable and easy to hold. For about $2.50, this deserves a spot on my writing desk. Uni-ball Vision Elite BLX Roller Ball Pen 0.5mm This pen is my go to right now. I like the inky flow – you don’t need to use a lot of pressure. I can tell the color is not pure black – I think it’s purple-black, but I’m colorblind so what do I know. Ink dries fast – I don’t know if it is Super Ink. Cost is about the same as the Jetstream – less than $2.50. Get one, you’ll thank me later. 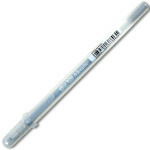 Gelly Roll Metallic This is a great pen for writing on darker surfaces. I use a lot of black or aubergine colored envelopes because they really pop visually when you look at a pile of mail. As they are dark, you need a bright writing utensil to contrast the paper and show up well. I’m a big fan of the Gelly Roll pens – they write very smoothly and I sometimes think they make my handwriting look better somehow. The archival quality ink is water and chemical proof and fade resistant. You can get them at paper and craft supply stores for $2-3 per pen. Hey. Lost touch with your story after YoG, and Anthony and Me. You’re on to new missions, cool. Pen suggestion~ as an Asian kid who had to practice words over and over and over, I think you should look into Asian pens. I highly recommend Hi-Tec-C, and I prefer the blue or the blue-black color, 0.5 mm. They’re hard to find in stores in the U.S, you may need to purchase them online. But they’re worth it! Thanks for the note and for following my various journeys. Asian pens are really interesting. I’ve been told that in Japan almost any mall will have a store completely dedicated to pens and paper and that the average store will probably put some of the best stores here to shame. I hope some day to travel there…although I’m afraid I’ll go broke if I go to those stores! I will check out the Hi-Tec-C.